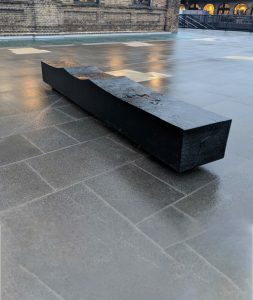 Heatherwick studios, approached us to help with some bespoke, charred Oak seating for the newly redeveloped Coal Drops Yard. The former Victorian warehouse has undergone a dramatic transformation from its past life. This ambitious work has seen the buildings emerge as London’s newest retail and dining destination. After some consultation, we commissioned to manufacture a range of charred Green Oak furniture. In total, we were asked to manufacture 30 benches in a range of styles. 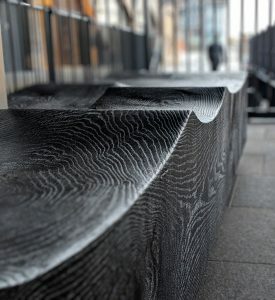 These huge Oak sections were then hand sculpted, charred and scrubbed into shape. The final result is a family of furniture, that complements the restored brick and iron buildings beautifully. 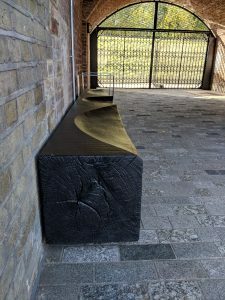 The benches certainly offer a welcome place to sit and enjoy the transformed Coal Drops Yard.